In our book, the People Side of Business, Lee Hersch and I outline the key need to support your employees. Support provides the critical foundation for people to function well in the work environment. Let me summarize the three principles I have covered and add the fourth. First, since peoples’ brains work from the bottom up, we understand that our employees are not just rational beings. They have a need for safety in the work environment and they are emotionally vulnerable. Leaders and managers who forget this obvious fact expect rational problem-solving and get frustrated with the other baggage people bring to work. Great leaders accept the sometimes sloppy nature of how people operate. They embrace people and work with what they have. Second, I discussed how people need nurturance from their managers and organization. Caring is not just a nice thing to do, it is a requirement for emotional safety and security. People have a dreadful fear of rejection and abandonment. They need to feel wanted and integral to the mission of the organization. Their passion can be an asset to the company if they are emotionally linked to its goals and values. Third, people are naturally wired to function well in a family-like environment. They will see their supervisors as parent figures and respond accordingly. They will also operate naturally in a team context, which replicates the sense of family they bring and paste onto the organization. The wise manager will support and build healthy teams where individuals can both feel comfortable and be highly productive. There is a fourth principle that rounds out the support component of taking care of people in business. People want to learn and grow in order to achieve mastery. People want to learn their jobs and perform them well. This drive, to learn new things and figure them out, is an essential component to humans surviving in a complex world. Supporting employees requires implementing all four of these principles. More about this fourth principle in the coming posts. As a business management consultant, I am often called in to help build or fix teams. All too often organizations learn of the power of teams, form them, and then not provide the guidance necessary for them to function well. Teams are very powerful in accomplishing organizational goals, but they are complex, sophisticated entities. They require that someone know and apply the technology of teaming. Does your team have these key ingredients? First and foremost, teams require competent leadership. The leader helps the group establish a trusting environment, based on acceptance, fairness, and common values. The team process is defined and refined as members negotiate their working relationship. Teams require that the organization provides adequate resources for their work endeavor. They need to have the tools, both of technological and interpersonal skills, to accomplish their tasks. Those tasks then are focused on producing clearly defined work outcomes. To function in a consistent and productive manner, teams need structure: roles defined, team processes understood, and expectations for performance. Working as a team is not just about working well together, but about being accountable to the goals of the organization. Teams need a diversity of ideas and members. When members contribute with a range of ideas there is greater opportunity for success. Those diverse ideas also come best from a diverse group of members; of age, race, gender, and experience. Finally, teams need to coalesce, and bring their ideas toward common solutions. Members must be able to resolve their differences into a common strategy and produce the expected outcome. Team technology is rocket science. Building a rocket is as much about teams working together as the materials and equations that make it fly. Learn teaming technology for your organization and your teams will make your company blast off. Pulling your team together in the work environment is critical to your success at the people side of business. Sports coaches pull their teams together by utilizing the common purpose of the group: winning. And, usually, the winning goes beyond the final score, it is for the school or for “the Gipper;” it is for a cause that has meaning and importance to the team members. The common purpose motivates and provides impetus for intense effort. At work, managers and leaders need to create a similar impetus for high performance. It doesn’t happen on its own. Managers and leaders help their employees buy into the mission and values of the organization, and be committed to the outcomes of their work. Yes, this can be done for any job. Early in the formation of NASA, a janitor was asked about his role in the agency. He replied, without hesitation, “My job is to put a man on the moon!” He had pride, purpose, and was committed to performing his job well. The key to pulling your team together at work is in making the effort to establish the common purpose, mission, and values of your organization. So, if your company makes cheese, the team can have a goal to make the best cheese on the planet. The team can make it with camaraderie and with mutual support of one another. The team can make it efficiently so that wages can increase and the company/employees can prosper. The team can establish common rules for the workplace which promote safety, mutual support, efficiency, and ultimately, total commitment. Teams are an essential building block for organizations because they evoke the natural framework us humans have programmed in our brains. People are comfortable and want to accomplish the work task for the good of the family. Teams are also remarkably efficient because they can harness the synergy of multiple people. When teams operate well, members share ideas, build on one another, and solve complex work problems. Don’t ask a business management consultant how to harness the working power of people in groups, ask sports coaches. They build environments where everyone pulls together for the good (outcome) of the team. Coaches convey the need to stick together, build skills, and play with commitment. Teams are the closest you can come in an organization to replicating the sense of security and togetherness you find in a family. Teams are the answer to what people are looking for when they come to work. Good teams—teams in which people are treated fairly and with respect—replicate the safety that we found tens of thousands of years ago living in small groups of trusted family members and friends. Managers who recognize this principle have a powerful tool at their disposal that can maximize the potential of their organizations. It’s hardwired and easy to overlook, but it’s incredibly potent. The research on attachment tells us that people are drawn to working in smaller groups, much like their original families. This occurs in the largest of organizations. For example, in the military, operations are usually organized by forces the size of a battalion or larger, but the functional unit is the squad, which is made up of nine to 10 people. There are scores of teams in every organization – in billing and marketing departments, in production and marketing. In each case, you’re going to need leaders who work hard to establish trust, build common purpose, provide individual support, and emphasize accountability and attention to results. More about pulling together in my next post. 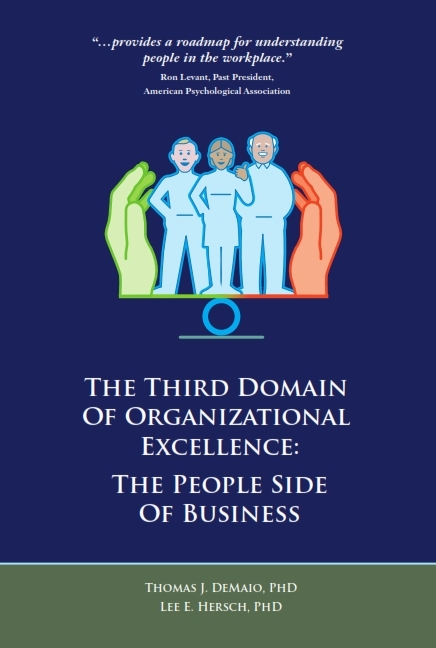 It is not just business management consultants who recognize that people working together tend to replicate family structures and dynamics. Any manager will tell you this. Healthy employees naturally want to feel connected to their organization and its mission just as they want to feel connected to their family. They bring the same techniques and the same emotional tools to achieve this aim at work as they do in a family. This principle is simply an extension of the science that underlies the essential human need for nurturance. People attach to one or two caregivers, usually their parents, for survival. Successful attachment is critical to their development. In the work environment, people apply this fundamental tendency for attachment to one or two supervisors. They look to this person or persons for leadership and guidance. It is the model humans impose on group relationships. Consequently employees want a supervisor to care about them, praise them, and encourage their development. It feels safe and secure, and it encourages people to give their best to the organization. Family contexts also provide a value system that employees can appreciate. Togetherness and team spirit are comfortable feelings that encourage involvement and effort. Family contexts also have implied rules, like fairness and equal treatment. Perceived inequities are cause for quick reactions and a sense of rejection. The real rub for supervisors and managers is the way employees automatically view them as parent substitutes. Powerful feelings are projected onto managers, from which there is no escape. The only path is learning how to deal with these strong projections to help the employee, benefit the company, and preserve one’s own skin. More about these family patterns in my next post. The human instinct to connect and be attached to a primary caregiver occurs in a family context. We are hard wired to form bonds with parent figures; the bonding provides us with safety and security in a hostile world. Employees bring this instinct to act and interpret within a family context to their worksite. As a result, they interpret the behavior of supervisors and teams from a family perspective. Given that people just put this “family” projection onto their coworkers, good managers and leaders learn how to utilize this aspect of their workers in the organizational setting. It means that they learn to work with the fact that employees will tend to place them in a parental framework. It means that they will provide adequate nurturance, and treat sibling coworkers in a fair and equal manner. It means that they will build a “family-like” environment through the teams established to accomplish the work. Many consultants have tried to convince employees that the company is not a family. After all, acceptance in a family is a given while acceptance in a company is based on productivity. While this difference does exist, people at work still want a family-like experience. There is not only a way to create this experience, but to have it benefit the bottom line. In the next several blogs I will discuss how this third critical principle can be understood and used to build satisfied and highly productive workers.